Alba loves her life just as it is. She loves living behind the bakery, and waking up in a cloud of sugar and cinnamon. She loves drawing comics and watching bad TV with her friends. Bookworld, Angus and Robertson, Amazon, and at all good bookstores. Hi Brydie! Thanks so much for the lovely message – my new book, The Secret Science of Magic, will be out in early 2017. This book was so much fun. I would really love to get a print for my wall of the cover that is similar to Wonder Woman! It’s a U.S. Edition. Is there a place to but one?? 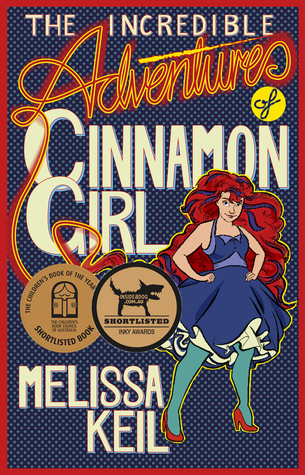 Pingback: The Increible Adventures of Cinnamon Girl | Come in and sit for a spell! I just finished reading your book (cinnamon girl) and it was so amazing! I couldn’t put it down from the moment I started reading. I’m Australian and I love baking and vintage dresses, so Alba was such a great heroine to read about. I’m going to buy my own copy as soon as I can and I so hope there is a sequel or a spin off. Just wanted to say Thank You. Pingback: The Inkys! (and how you can choose them!) | Mazreads! Oh my gosh!!!!!!!! The Incredible Adventures of Cinnamon Girl has got to be in my top 5 favourite books. (Some of them are TFIOS, If I stay and stuff like that so you can see how much I LOVE this book!) I am Australian and I love vintage kind of dresses that Alba wears, I also love drawing wonder woman and Marvel superheroes. (Preferably the girls though because they are the best!) I am also into baking and my uncle and auntie run a bakery. As soon as I started reading I was like….. OMG I found my twin!!!!! Have you written a sequel to this book? IF NOT MELISSA YOU NEEEEEEED TOO BECAUSE I LOVE THIS BOOK TOO MUCH!!!!!!!!!!!! That will be my dying wish. (Well maybe I am kind of exaggerating a bit on that being my dying wish. When I think about it, my dying wish would probably be to travel all around Europe…. but that’s a whole other story. I just read Cinnamon Girl today and I just wanted to say that I absolutely LOVED it! I read so many books and it’s not very often that I come across one written by an Australian author in an Australian setting with Australian characters that say Australian things (I don’t think I’ve ever said the word ‘Australian’ so many times in one sentence haha). I just love that you’ve written a YA book that isn’t afraid to be from Australia and that’s one of the things that really stood out to me. Of course, I loved the amazing cover, your gorgeous writing style, and the hilarious and lovable characters as well. Once I picked Cinnamon Girl up, I couldn’t put it down (honestly, the only time I put down the book while reading it was to gaze adoringly at the cover) and I’m really excited to get my hands on a copy of Life in Outer Space so I can read that as well! I really hope you continue to do well. I’ll be telling all my friends about Cinnamon Girl (they’re big readers) and hopefully they’ll all love the story as much as I do (I’m sure they will 🙂 ). OMG! The cover is awesome! After reading “Life in outer place” last year, I couldn’t wait to read “The adventures of cinnamon girl”. I loved reading every page of this book! It was adorable, perfect and just full of awesomeness! Cheers for Melissa for getting another successful novel in the shelves of every library and book shop. I love your writing style and stylish scenes. Wish you the best for further writing. Can’t wait for you to write another book! Thank you very much, glad you enjoyed them! I have a question for you. This a long shot….you probably forgot, anyways, when our school book club from Ballarat High School met you at the writer’s festival last year, you met a blonde curly haired guy named Kyle. You said that you’ll add him in one of the books you’re writing, not a leading character but a side character. I couldn’t really spot him in the book but, if you did put him somewhere in there could you please tell me? Hey there, of course I remember Kyle (I think I might even have a photo of your school group on my author Facebook page!) I have to admit I TOTALLY forgot that I said that back at Melbourne Writer’s Festival, but now of course I remember and am feeling very sad that I forgot Kyle’s mention. But – I’m working on my third book now, and PROMISE I’ll include him somewhere – he just might have to wait a little while, cos it’s going to take me a little while to write :)) Say hi from me, and thanks again for reading Cinnamon Girl!! I finished Cinnamon Girl and absolutely LOVED it! I am planning on reading Life in Outer Space soon as well. It was a great book one of my favourites! Hi Melissa! I just wanted to say that I loved Life in Outer Space and Cinnamon Girl. I actually interned at Peachtree Publishers, so I got to read Cinnamon Girl before it came out. I read it start to finish in 5 and a half hours. I looked on Amazon, but it was only out for the Kindle. Hard copies coming out soon? By the way, Camilla (LiOS) is one of the best characters I’ve read in a LONG time (and I read a lot). She reminded me so much of one of my best friends, that I got her the book for her birthday. I just finished reading Life in Outer Space and loved how it was written. You completely nailed writing from a teenage point of view. I loved it so much that I’m going to go and buy it, but I cant find anywhere that sells it in a hardback format. Is there a hardback version of Life in Outer space or is it just paper back? if not will there be a hardback format in the future for Life in Outer Space and The Incredible Adventures of Cinnamon Girl?